April Showers… Umbrella Coverage…Get it?! We insurance agents love to talk about Umbrella insurance coverage in April. It just makes sense. We find the ability to play off of this phrase humorous in our right. No matter how many times we recommend Umbrella insurance coverage, it still remains a mystery to most clients. What is it? What does it cover? And why do I need it? Umbrella coverage is an additional layer of liability that provides coverage over both your Home and Auto policies. Once the underlying limits on your Home or Auto policy are paid and exhausted at the time of a claim, Umbrella coverage will provide additional financial protection. A Personal Umbrella policy offers extended coverage for residences, automobiles, recreational vehicles, watercraft’s, youthful drivers, DUIs and alcohol related violations. Defense Costs, Teen Drivers, Intoxicated Party Attendee, Dog Bites, False Arrest, Libel and Slander, Pain and Suffering and Volunteering. Umbrella coverage starts at $1,000,000. You can purchase additional limits up to as much as $10,000,000 or more, depending on the insurance company. Personal Umbrella coverage can be obtained for a minimal premium. Depending on how many assets you have to protect, for example, number of properties, automobiles and drivers in your household all affect the rate. Umbrella coverage starts at $170 annually and goes up from there. Umbrella coverage isn’t just a good thing to talk about in April! Consider adding this additional layer of liability over your insurance policies any time of the year! Call or e-mail one of our specialists for more info! Is Wear and Tear Covered by my Homeowner Policy? You may notice that there are some areas of your home that took a beating during these long winter months. Has the thought crossed your mind to call your insurance company and file a claim? Is any of the wear and tear that you see covered by your Homeowner Insurance policy? The exterior of our homes in New England certainly get the raw end of the deal. Snow, ice, hail, rain, wind, saltwater, blazing heat and on most days we are sure to see more than one of these! We experience extreme weather shifts from one hour to the next. We ask a lot of our roofs and siding, but unfortunately, over time we see that these things start to deteriorate. The condition of our roof shingles, exterior siding and trim, fences and sheds weaken, peel and crack. Will the insurance company help to restore wear and tear back to new? Your Homeowner Insurance policy is not a maintenance policy and does not pay for wear and tear. The purpose of Homeowner Insurance is to help protect you in the event a significant financial loss. In order for your Insurance policy to provide compensation for damage, it must be part of a covered peril, such as water damage, wind damage, fire, smoke damage, etc. It is up to us as Homeowner’s to maintain our properties. It is up to us to mitigate further damage by repairing the areas of our home that deteriorate and break down. If you have questions about the type of damage that is covered under your specific Homeowner policy, please contact one of our insurance counselors at Info@insurewithRichardson.com. What are Disappearing Deductible Credits? You have Disappearing Deductible Credits on your auto policy?! Many insurance carriers reward you for clean driving years with disappearing deductible credits. For each clean year, you earn money that will apply toward your collision or comprehensive deductible in the event that you ever need to put in a claim and your deductible applies. You have a $500 Collision Deductible on your auto policy. You have $250 in disappearing deductible credits. You are involved in an at-fault accident in which your deductible will apply. The insurance company will issue you a check for the damage to your vehicle less the amount of your deductible. Normally, you would receive a check minus your deductible amount of $500. However, with your credits, instead of them withholding $500, they will only withhold $250 because of your credits! Every carrier can be different in the amount that they give you for each clean driving year and the maximum that they allow you to accrue. More questions on this? Call or Text us 781-826-5161. Our insurance advisors can help you understand your benefits. You work hard for your money…in turn, you work hard for the items you spend your money on! We’re here to tell you that not all insurance is created equal when it comes to your contents and personal property. Typically your ‘stuff’, your personal property, your contents-whichever term you fancy-are covered under Section C- Personal Property on your Homeowners, Condo or Renters Insurance policy. They are covered and subject to your policy deductible if they are damaged as a result of a loss. There are certain personal items that have coverage restrictions under these insurance policies. Luckily, as in most cases with insurance limitations, insurance companies give us an option to buy back coverage!! And not only buy back coverage, but in some cases, get coverage that doesn’t come with a deductible! 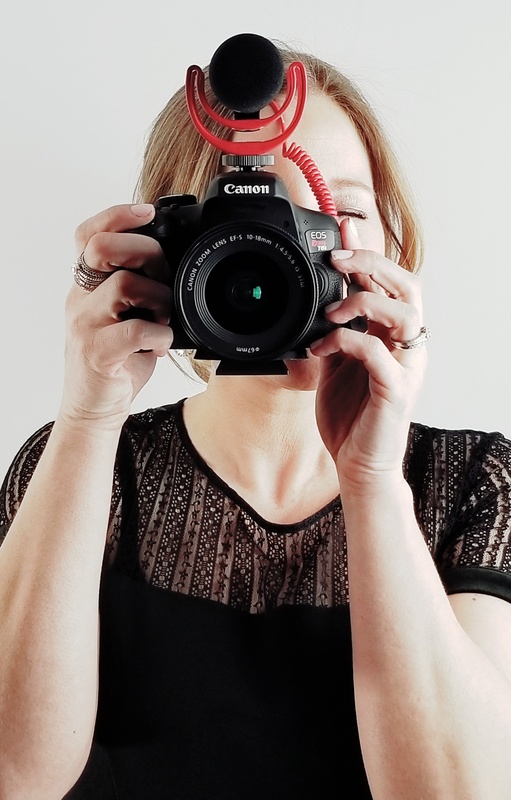 If you have a collection of valuable items that you aren’t sure if they would be fully covered in the event of a loss, give our insurance advisers a call and we are happy to answer any questions you have! Do you have questions regarding scheduled jewelry? Does Auto Insurance Cover Damage from Fires? Not all car insurance plans cover fire damage to your auto. The type of insurance that would cover fire damage to your vehicle is an optional coverage, which is not mandatory in the state of Massachusetts. This means that if you’ve ever built your own auto policy with one of those on-line carriers without the assistance and guidance of an insurance agent, you may have not elected to buy this coverage! YIKES! According to the National Fire Protection Association, fire departments in the US respond to approximately 287,000 vehicle fires annually! If you submit a claim for fire damage to your insurance company, they may require that the incident be reported to the fire and police departments. Property loss as a result of vehicle fires amount to more than one billion dollars per year. 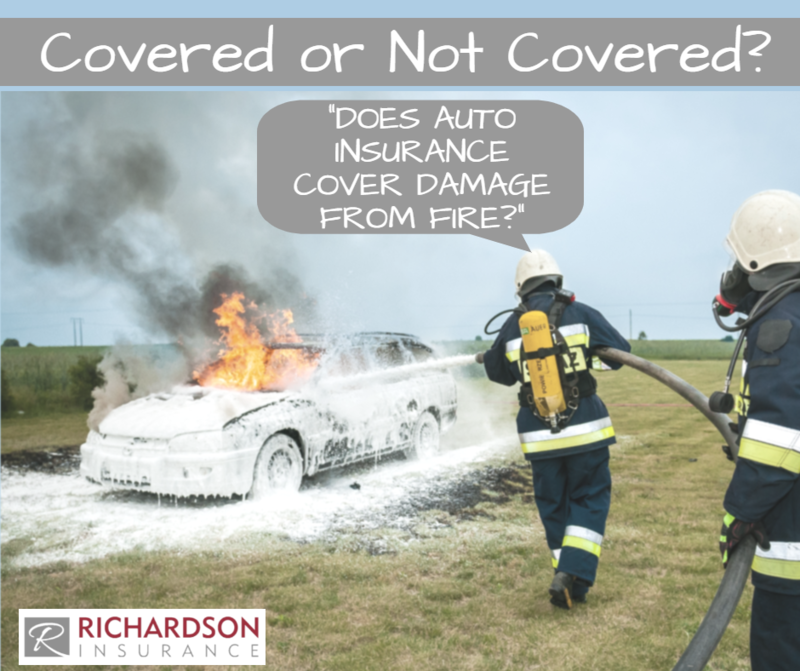 Comprehensive Coverage, Part 9 in the Massachusetts Automobile Policy, is the coverage you need in order to have protection for fire damage to your vehicle. If a fire is a result of a motor vehicle accident, then the damages will likely be covered under the collision portion of your auto policy. A deductible that you choose applies to this coverage. Deductibles start at $300 and go up from there. We usually recommend a lower deductible under Comprehensive, Part 9, to our clients because this amount is most often the responsibility of the insured at the time of a loss. Due to the number of fraudulent fire claims that insurance companies see, a fire claim is investigated thoroughly before any payment is made. Do you have any more questions regarding comprehensive coverage on your auto policy? We can help. Reach out to us at info@insurewithrichardson.com. What if a meteorite or airplane parts fall from the sky and land on my vehicle?!? What should I do if a sheet of ice and snow comes off of another vehicle on the highway and hits my car causing damage?!? If you carry Comprehensive Coverage (Part 9) on your policy, then you DO HAVE COVERAGE if your vehicle is ever struck by a falling object (After your Comprehensive deductible is applied). If your car is struck by an object that came off of another automobile, do your best to get their information. If subrogation and recovery of your deductible is possible, it is vital to have the plate number of the other car! Otherwise, there is no way for the insurance company to recover your deductible and you will end up responsible for the entire cost $$ of the repair! Do you have additional questions? Shoot us an email at info@insurewithrichardson or click the lightning bolt to send us a direct message! 1. HOMEOWNERS INSURANCE EXCLUDES FLOOD. All homeowners insurance policies exclude flood. Subsurface water of all kinds is also excluded from the policy. If the home has water in the basement, you need a sump pump! You may be able to purchase limited coverage on the policy to protect the home if the sump pump fails or water backs up from a drain or sewer. Limits and coverages will vary slightly from each insurance company. 2. ALL HOMES ARE IN A FLOOD ZONE. We often get the question, “Is my home in the flood zone?” The short answer is yes, every property is in a flood zone. What will determine the need for and cost of flood insurance is which zone it is in. Moderate to low risk zones include B, C, and X. These zones represent 100-500 year floodplains. The A and V zones represent a higher risk for flood, and your buyer’s lender will typically require them to carry flood insurance. Most of the A zones represent at least a 26% chance of flooding during a 30 year mortgage. 3. FLOOD INSURANCE CAN BE VERY INEXPENSIVE. If your buyer’s new home is in a preferred flood zone, the premium for flood insurance will run between $400-$500 a year. Most people believe that the disaster relief programs will help after a flood. Often this “relief” is given in the form of a loan that would need to be paid back – WITH INTEREST! Flood insurance is the best way to protect your investment from this risk. I have a crack in my windshield, is this covered by insurance? In Insurance there can be a lot of ‘clear as mud’ answers. We’ve all been there. You are driving down the interstate behind a big tractor trailer that kicks up a huge ROCK …or something worse…and it hits smack dab in the middle of your windshield! And so starts the inevitable spidering of your windshield. Depending on your schedule…you may let it go a little longer than you should, but as that crack begins to overtake your line of vision, you teeter on the line of a crack repair or a full windshield replacement. If the crack is the size of or smaller than a dollar bill, glass companies can usually repair the damage without having to break the seal of the windshield. What happens if the crack is longer than a dollar bill? This will likely require a Windshield Replacement. What kind of car do you have? Does your windshield have sensors in it? The cost can range from $200 to $1,000 depending on what type of glass you need. If you carry Comprehensive coverage on your auto policy then YES, the repair OR replacement will be covered by your insurance policy. Glass coverage is included in Comprehensive coverage and is not subject to your Comprehensive policy deducible. MAKE SURE YOU DONT HAVE A SEPARATE GLASS DEDUCTIBLE! Sometimes there are companies who write policies and try to offer the ‘cheapest insurance’. To accomplish this, they may add separate deductibles for Glass or Personal Injury Protection. Make sure to review your insurance to see if these sneaky deductibles have been included. For recommendations on what glass companies to call in the event of a cracked or broken windshield, contact us! 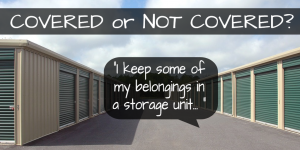 Are my contents in storage covered on my Homeowners Policy? Homeowners Insurance typically includes Personal Property Coverage, or Coverage C on your policy. Personal property is the contents in your home, as well as items kept ‘off-premises’. 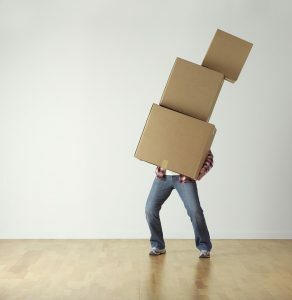 This would include property in a STORAGE UNIT or at another location. Coverage would include unfortunate events such as fire, theft, vandalism, but NEVER FLOOD! Your personal property coverage has a LIMIT, typically 50% or 70% of your Dwelling amount, depending on your policy. But BEWARE, many homeowner policies have a lower limit for personal property that is kept away from your home. Some as low as 10% of your Dwelling, or Coverage A, amount. Example: If you have $100,000 in Personal Property Coverage, you may only have $10,000 in coverage for property kept OFF-PREMISES. This may not be enough coverage for high valued items such as art, antiques, appliances, electronics or jewelry kept in a storage facility. So how do you get more coverage for items kept off-premises? You can increase your Coverage C limit to ensure you have adequate coverage for all of your personal property, both on and off premises. You can schedule high value items separately so that they are protected for their full value. You can obtain additional insurance from the Self-Storage Unit either as part of your contract with them or for an additional fee. Before you move your items in an offsite storage facility, call the team at Richardson Insurance to make sure you’ve got enough protection! What is the Massachusetts Auto Surcharge Threshold? What is the Massachusetts Auto Surcharge Threshold and how does it apply? 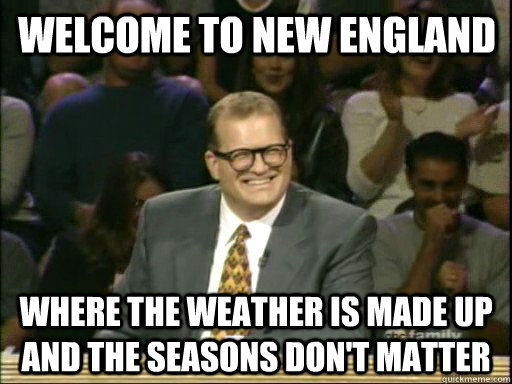 It’s a cold snowy New England morning and you are on a merry drive down Route 3. Suddenly, you hit a patch of black ice and slam on your brakes to come to a halt, but fail woefully. By the time the skid is over, your vehicle is pressed into the bumper of a brand new BMW. With both vehicles drivable, you exchange insurance information and drive off. This scenario is one of many scenarios that play out on our roads every day in Massachusetts. It is usually followed by a notification of an accident surcharge a few weeks later from your insurance company. With the insurance carrier deeming you more than 50% at fault and the claim being in excess of the surcharge threshold, this will be included on your driving record, and your premiums will be adjusted accordingly. Before July 2015, Massachusetts legislation placed the surcharge limits at above $500 for a minor accident, and above $2000 for a major accident. This implied that an at-fault accident that causes over $500 in damages to someone else’s property is considered a minor accident with 3 surcharge points added to your driving records. For damages to property or bodily injuries above $2000, the accident is classified as major. Four surcharge points are added to your driving record. With vehicle production costs on the rise, the costs of basic accidents have also gone up. A simple fender-benders accident could cost into the thousands in repairs, easily exceeding the $500 mark, and even the $2000 point. With sensors and computers in all new vehicles, the cost of repairs continues to rise! The previous thresholds did not properly reflect the current economy and inflation over the years. As a result, accidents previously considered to be minor could easily become major. As of July 2015, this legislation was revised, and the thresholds were revised. Looking for more information on the Massachusetts Safe Driver Insurance Plan (SDIP)? Click here. What is the Current Auto Surcharge Threshold? The current Massachusetts auto surcharge threshold places a minor at-fault accident at between $1001 and $5000. Consequently, major at-fault accidents are those with damages anywhere above $5000. This new threshold will particularly appeal to drivers who could have received surcharges for minor accidents like fender-benders. The point system remains the same, but your chances of getting a surcharge on minor accidents has been reduced. If it is determined that you are more than 50% at fault you will receive a surcharge notice from the insurance carrier. Of course, you also retain the chance to appeal any decisions. Black ice, wet leaves, and solar glare, if present at the time of the accident, can be considered when determining if you were more than 50% at fault. In MA it costs $50 to file an appeal and a hearing will be set to state your case, with the chance of having the surcharge overturned. This hearings typically take place at the registry of motor vehicle. An independent agent can find you the best option for your auto insurance. Writing with multiple carriers allows an agent to maximize your insurance premium savings. Have any questions about how the surcharge applies to your auto insurance policy? Call/Text (781-826-5161) or email (info@insurewithrichardson.com).